Ashley Lewis, @the_blondologist, from Nest Hair Studio in Richmond, Virginia, donned her creative color cap and stepped away from her passion for balayage to create a look would make the owners of Pulp Riot proud. 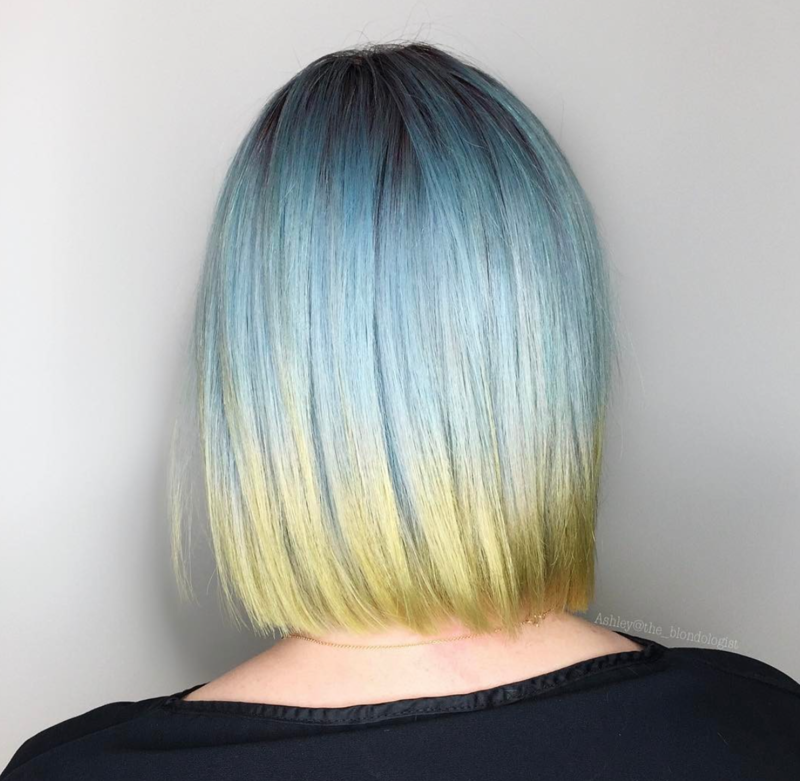 Below she shares her Pulp Riot formulas and colormelt process, and then explains how she achieved a smooth, silky finish using Eufora styling products. Style: Blow Dryer (Elchim 8th Sense), Large-Toothed Comb, Bumble and bumble Flat Brush. “Karen was pre-lightened to a level 10 platinum and I left about one inch of regrowth of her natural level 7/8,” shared Ashley. Step 1: Apply Formula 1 to roots and softly smudge over regrowth line. Step 2: Starting at the nape, apply Formula 2 blending at regrowth line leaving last two inches uncolored. Step 3: Apply Formula 3 through ends. NOTE: Ashley did NOT shampoo her client after color was rinsed out using cold water. She did condition Karen’s hair with Eufora Bodifying Conditioner. Step 1: Spray about seven pumps of Eufora Nourish Collection Nourish Fortifi Keratin Repair throughout hair. Step 2: Cocktail in hand about a nickel-size amount of Eufora Style Sculpture Glaze and five pumps of Eufora Style Illuminate Shine Mist and apply to hair. Comb through using a large-toothed comb. Step 3: Apply Eufora Boost Root Lifting Spray throughout roots. Step 5: Finish blow-drying using flat brush to achieve a smooth polished blow dry. Step 6: Take fab pics! A self-proclaimed Blondologist—one who studies blondes and their behaviors—Ashley is a Sola studio owner who co-owns Nest Studio in Richmond, Virginia. When she’s not in the salon, she is an educator for The Business of Balayage and is absolutely killing it on Instagram.